Unfolded, ready to use. A low footrest, sturdy arms and adjustable seat height make it easy to get into the chair. 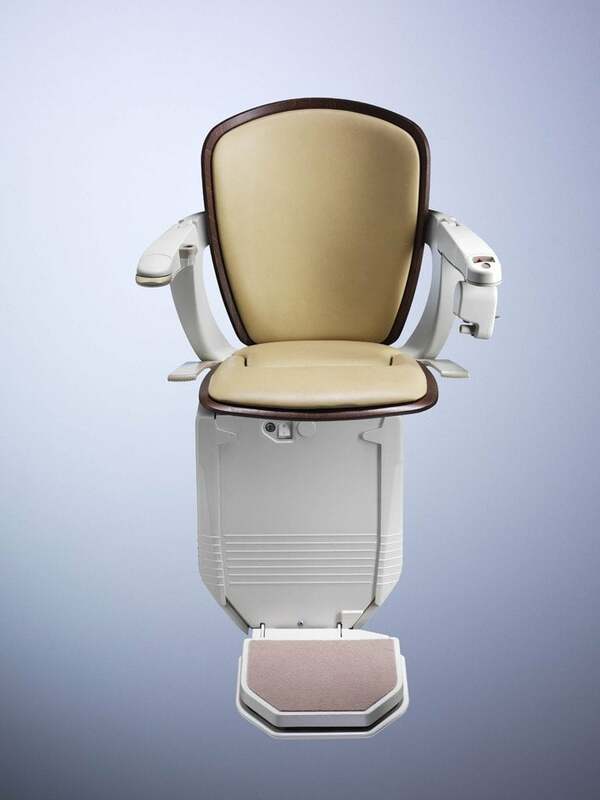 One-step folding avoids the need to bend down to fold up the footrest. 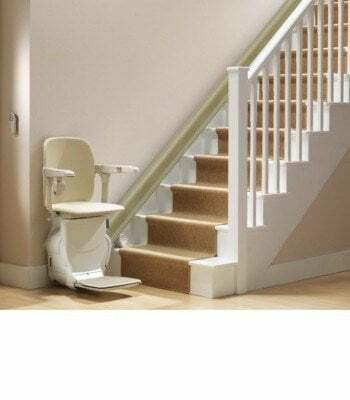 This improves safety at the top of the stairs. 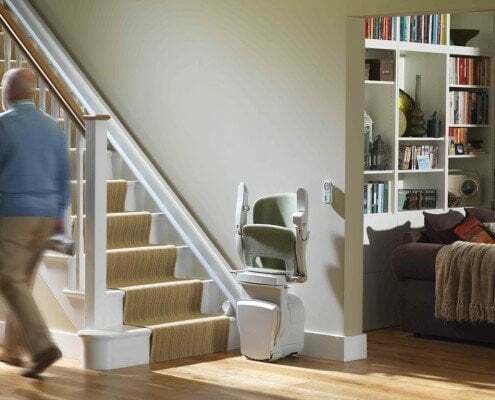 Folded, the Starla stairlift leaves room for people to walk up and down the stairs. The seat belt can be used with one hand, and is mounted on one armrest, so it’s easier to reach than a car seat belt. 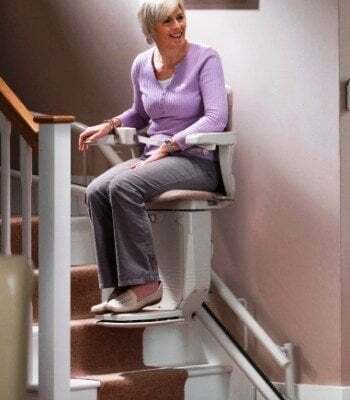 The chair rides smoothly up or down the stairs, and stops automatically when it reaches the far end. 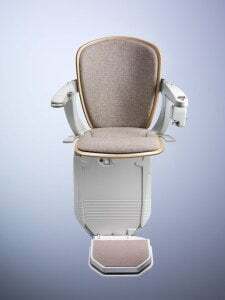 Sensors stop the chair if it touches an obstruction. When swiveled at the top landing, the back of the chair blocks the stairs, for safety. 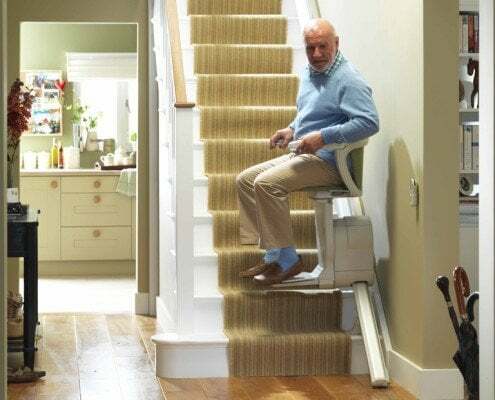 In your home today, or at your convenience. 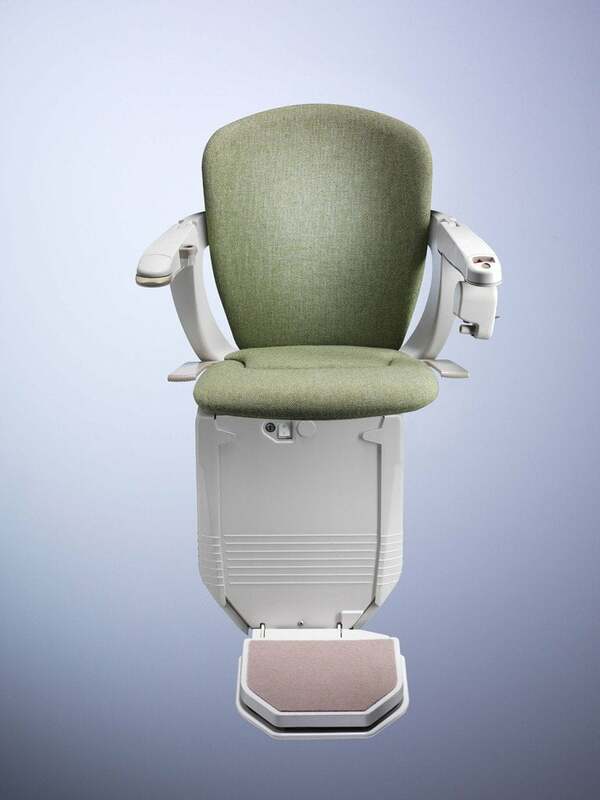 The Starla chair is our newest design, and we think it has the best combination of safety and ease-of-use features of any stairlift chair available today. Unusual comfort. 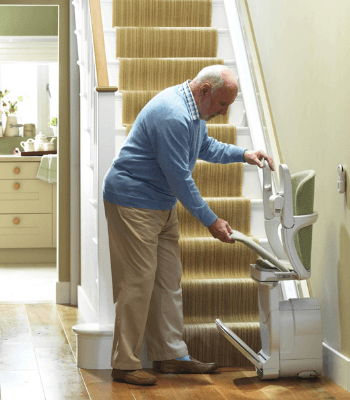 Most stairlift chairs sit quite upright, so that they don’t take up too much room on the stairs. The Starla has been cleverly designed to lean backwards slightly for comfort and security, without taking up any more room than previous designs. A footrest-fold button. A button on one armrest folds the footrest up and down, so you never need to bend over near the stairs – a fundamental safety enhancement. A seat-load sensor. The armrest control won’t work until the user is securely seated in the chair (so it won’t suddenly move as you sit down). 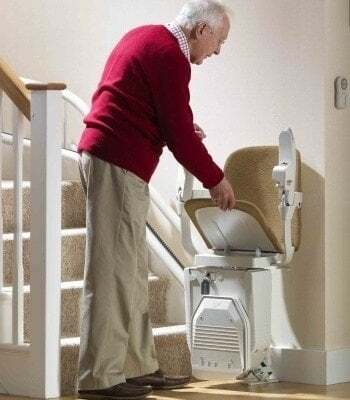 To send a small load (such as a laundry basket), use the remotes on the landing. Starla has the only seat belt designed just for a stairlift. 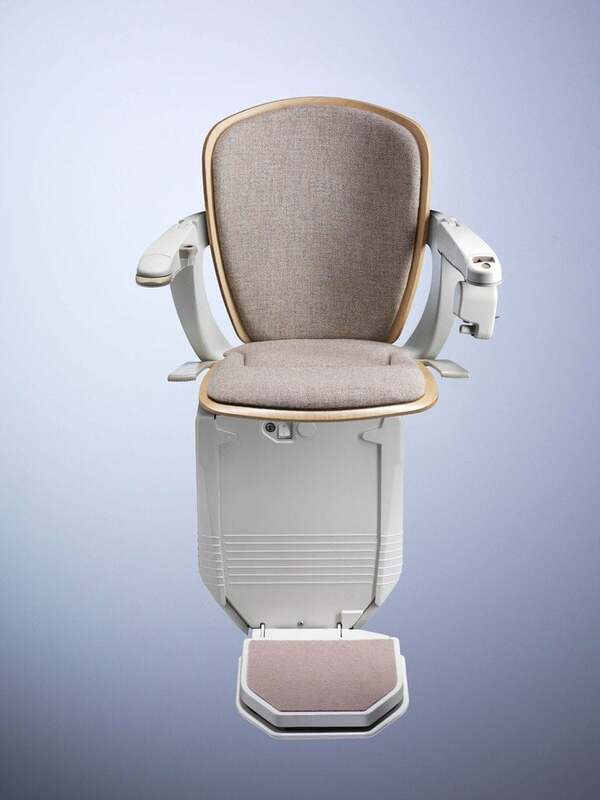 Instead of being tucked down by the users’ hips like most stairlifts, the Starla has a retractable seat belt that is mounted near the tip of one armrest, and which can be operated with one hand. It simply latches into a hole on the opposite armrest. Upholstery choices. As well as fully upholstered, Starla comes with the option of light- or dark-wood trim. See the ‘Colors’ tab. Downside armrest protection. 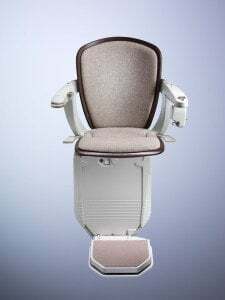 For additional safety, the armrest nearest the bottom of the stairs must be lowered before the chair can be moved from the using the control on the chair. A compliant control. 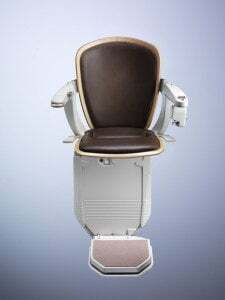 Instead of being a hard switch, the control on the armrest is slightly soft and shaped to allow it to be pushed by many parts of the hand. Stannah has the best testing process in the industry. 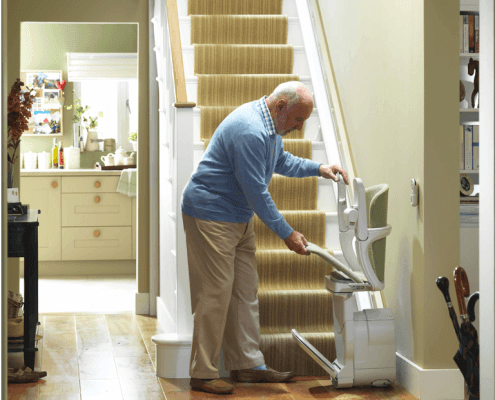 All Stannah stairlifts are tested at full load for the equivalent of 10 years of use, and the motor/gearbox is tested for the equivalent of 20 years. This is a robust stairlift designed to serve you well. 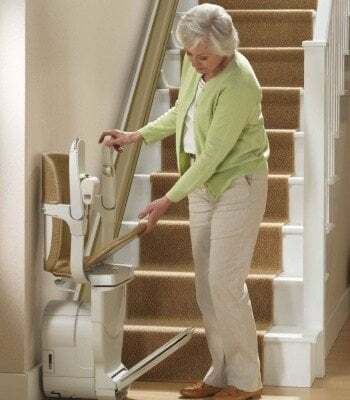 Dimensions measured from the wall are nominal – the addition of a wide baseboard or similar obstruction may affect the dimensions taken from this point. The dimensions are accurate, but you should add 1″ clearance for the user. Rail protrusion at top landing: typically none, unless a rail over-run onto the top landing is chosen. 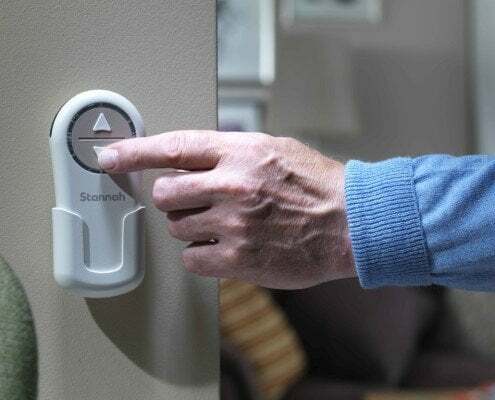 Over half a million installed globally, for all ages. 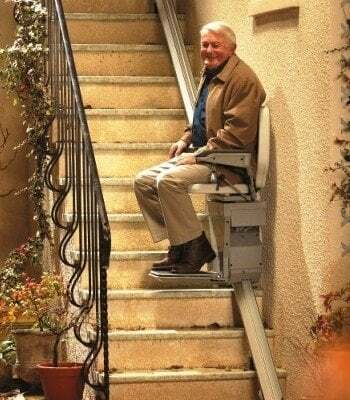 to walk up and down the stairs. 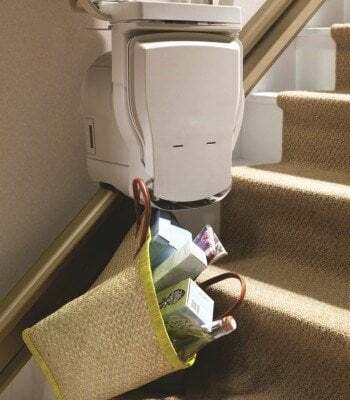 Plugs into a regular outlet. We’d love to give you a tour! We’re happy to come and advise you. Friendly, free, and without obligation.